A first-generation college student and member of the LGBTQ community, Arizona State University junior David John Bier has never been one to let barriers hold him back. But he is no stranger to closed doors, either. But a job as a barista at a local Starbucks changed everything. Through ASU’s partnership with Starbucks, Bier took advantage of the company's College Achievement Plan that allows employees to take online classes part-time of full-time toward earning an unergraduate degree in 80 different majors. Bier began school in 2015 through ASU Online, and he's never looked back. He’s majoring in public service and public policy in the College of Public Service and Community Solutions. This past summer, he interned on Capitol Hill through an innovative program designed to help students just like him. College to Congress is a bipartisan, nonprofit organization that helps low-income, high-achieving students pay for housing, food and other costs incurred while they intern in Washington, D.C. Through a seven-step process, Bier was one of 12 students selected from a pool of over 300 applicants. 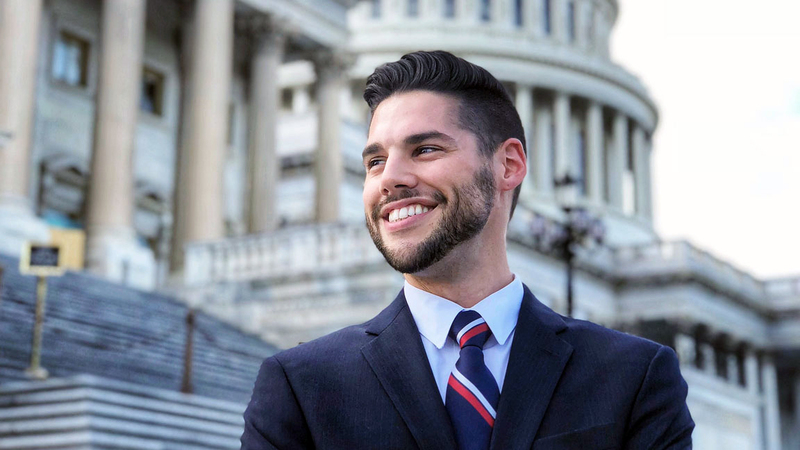 He was placed as an intern for a congressional committee in the U.S. House of Representatives, a once-in-a-lifetime opportunity that Bier is thankful for. Upon his return from the nation's capital, he made the decision to move to Los Angeles. In a recent post on his blog, Bier said, “I’ve always been curious about new cities, new people, and new possibilities, and I’ve pushed myself to be comfortable with getting uncomfortable.” He’ll continue his online studies from Los Angeles and plans to graduate in May. Bier spoke with ASU Now about his experience as an online student, his internship in Washington and what’s next to come. Question: Where did you intern in Washington, D.C., this summer and what kind of work were you doing? Answer: I interned with the Democratic Party staff of the House Committee on Oversight and Government Reform. Under the leadership of the chairman, Rep. Trey Gowdy, R-S.C., and the ranking member, Rep. Elijah Cummings, D-Md., the committee is responsible for investigating any waste, fraud or abuse of taxpayer dollars and holding government accountable to the American people. My daily tasks included curating daily press clips, researching media coverage on issues of importance for the team, drafting press releases, updating the website, and designing graphics and digital content. Q: How has your experience in Washington, D.C., benefitted you? A: My experience in Washington, D.C., was a once-in-a-lifetime opportunity. I got to experience and learn the inner workings of Congress, witness Republicans and Democrats craft legislation — either apart or in a bipartisan manner. It enabled me to enhance my networking skills, gain professional contacts and make new friendships with interns from across the country. Q: This wouldn’t have been possible without a program called “College to Congress.” What is it and how has it helped you? A: College to Congress is a nonprofit, bipartisan internship program that provides a scholarship for low-income, high-achieving students. They cover the costs of interning in Washington, D.C., which is one of the most expensive cities in America. They offset the costs of housing, food, travel, a professional wardrobe and more. They also have a weekly leadership series to craft skills such as networking and dining etiquette and a bipartisan ally program which paired me with a mentor of the opposite political party to facilitate bipartisan conversations. Most internships are unpaid, and it would’ve been impossible for me to finance this without the help of College to Congress. Q: Can you talk about the challenges you’ve faced? A: When I came out as gay to my family, they disowned me. Affording college was no longer possible and I faced many closed doors and challenges to get ahead. I threw myself into work and moved across the country numerous times, looking for new opportunities. I eventually found myself working for Starbucks and learned about the College Achievement Plan with ASU. That program allowed me to begin college, which was life-changing for me. It awoke in me a desire to give back and help break down educational barriers, so others never have to experience what I’ve had to. I also credit the program for inspiring me to land an internship in 2016 at city hall in Salt Lake City. A six-month communications internship in the mayor’s office there led to a full-time appointed position as the communications and content manager. While I’m no longer at Starbucks, I continue with ASU and have about a year left in my public service and policy program. A: For me, public service is about doing good for those you care about — even if you’ve never met them. I take to heart the words of Theodore Roosevelt who said that “…the best prize that life has to offer is the chance to work hard at work worth doing.” Those words inspire me to change the world. Q: What do you aspire to do with your degree? A: With my degree, I hope to build on my professional experiences and work in political communications. I would like to pursue a master’s degree in public administration or communications. In the long-term, I would like to run for office. Q: Over the summer you decided to move to LA. A: I love Los Angeles. My best friend lives there. Most importantly, I feel a creative spirit in the air in LA unlike anywhere in the world. I believe it has the hustle and grind of D.C., except everyone knows how to relax and enjoy life. Making an impact and taking care of yourself are not mutually exclusive. Q: You've expanded your career interests to include storytelling. Can you talk about how your college experience will help with that? A: My college experience has been unique. Since starting ASU Online, I've lived in Wisconsin; Utah; Washington, D.C.; and now California. I've always stuck with my undergrad program as my life evolved and changed around me. I feel I've had an advantage to use the teachings and knowledge of the public service and policy program in everyday life — whether it be traveling, networking with new people, seeking to collaborate, or pushing myself to be a leader. A: I’m a huge advocate for ASU Online and the public service program; the flexibility of online courses which allows me to work full-time and go to school full-time, plus the high-quality course work and instructors, make for an exceptional college experience. I wouldn’t have it any other way. Through my education at ASU and the opportunities and challenges I've experienced, I want to create a platform for others to feel empowered — whether that be through storytelling, multimedia, or social impact work.